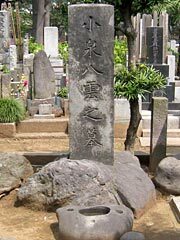 Japanese people usually have a family grave. 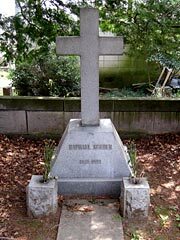 Only when there are special reasons, for example the deceased family members had especially high position in the society or were famous artist and the family is proud of that, an individual grave is built. Traditionally graves had to be built in principle in the graveyard of a temple and all Japanese families were forced to belong to a certain temple. The Emperor's government replaced the Tycoon's government in 1867 and the Japanese people were liberated from their compulsory relation to Buddhist temples and their graveyards. 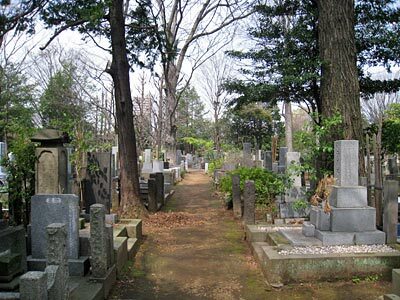 At the same time the first religion-neutral cemeteries were founded in Tokyo in 1874 and Zoshigaya Cemetery was among them. 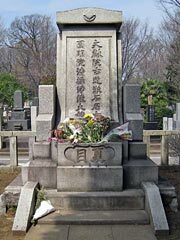 As anybody can have his grave in Zoshigaya Cemetery, we can find there graves of many prominent or interesting persons. I would like to take up some examples. 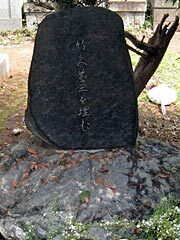 Onibozu-Seikichi (1776-1805) was a thief. He became famous because his crime was dramatized by Kabuki Theater. 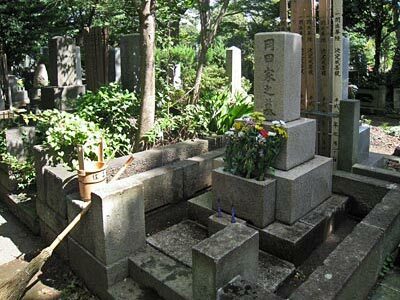 His grave used to be popular among gamblers and is now among students preparing for an entrance examination. Koizumi Yakumo (1850-1904) was born as Patrick Lafcadio Hearn in Greece. He later found his home in Japan and among others collected Japanese ghost stories and published many Japan related books. Raphael Koeber (1848-1923) was a German born in Russia. He was teaching philosophy at the Imperial University of Tokyo to Natsume Soseki and other leading intellectuals in the early stage of the Japanese industrialization. Natsume Soseki (1867-1916) was a writer representing Japan in the early 20th century. 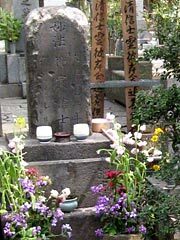 The large grave stone has a very bad reputation, because as it is thought to be testeless for an intellectual like Soseki and this bad taste is attributed to his infamous wife. Takehisa Yumeji (1884-1934) was a painter. He was and is awfully popular because of his romantic drawings of Japanese beauties. The natural stone grave fits his image as an artist. 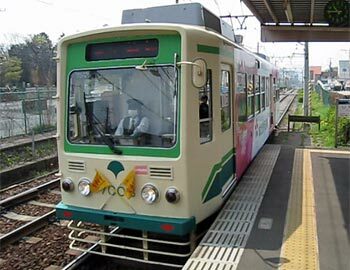 The only streetcar line - all others were removed since the 1960s - in Tokyo goes by the Cemetery. There are three flower shops in the Cemetery. They also keep the graves clean. Our family has a grave in this Zoshigaya Cemetery, because my grandfather built it for his family. My grandparents and their three early died sons have their repose here. My grandfather Taikichi (1890-1946) was born into a ship-owner family in Kanazawa, Ishikawa Prefecture. Because he was the sixth son of the family, he went to Tokyo to try his luck. 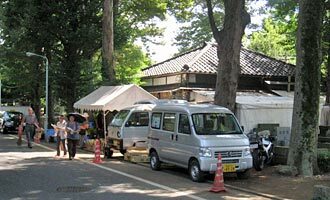 He founded an ironworks near the Otsuka station and got married to Masu (1897-1972), daughter of the owner of a construction company in Chiba prefecture. Taikichi and Masu had three daughters and three sons. All daughters grew up and bore their children, but sons died without exception earlier than their parents. This meant that nobody would carry the family name "Okada" and take care of the family grave in the future, as it was traditionally and legally the duty of the first son. Therefore, when my parents got married, my father became adopted by the family Okada to keep the family line going. Now, as the first son I am required to overtake the duty from my father. However, the problem would occur after my death, because I have no son. Fortunately, I have a younger brother and he has a son. Therefore my nephew is now expected to do the job as the representative of our family after my father, me and my younger brother, because the grave belongs to the family Okada as a whole. By the way, I was told by my grandmother that our family name was presented by Lord Maeda of Kaga Domain, as the family contributed to the Domain as ship owner. Permission of a family name was a honor to merchants, because only samurai and noble people were allowed in principle to have a family name in the feudal time. Rich marchants used "yago", name for a company or shop, instead of family name. Still now some companies use their old "yago" such as Matsuzakaya, Matsuya and Isetan. Our yago was "Kashiya". I wonder why a shipping company should have a yago which means "confectionery". Maybe the original family business was confectionery and my ancestors continued to use the old name even after they had changed business. Anyhow, as far as I know the founder of our family was called Okada Jiemon (I write here the family name first and the given name, in accordance with the Japanese tradition). His son was Okada Tahei and he was usually called as Kashiya Tahei. Four generations used the same name and my great grandfather ( - 1916) was the last who used this historic name.